Home Golf World News General New Rules of Golf: Know how the rules will boost your game? New Rules of Golf: Know how the rules will boost your game? The new year has arrived and with this, the new rules of Golf have also been implemented. A look at the major changes to the new rules. The ball must be dropped straight down from knee height. Knee height means the height of the player’s knee when in a standing position. The ball must fall straight down, without the player throwing, spinning or rolling it. If the ball rolls outside the relief area it must be dropped again, then if it rolls out a second time, the ball must be placed where it first struck the ground on the second drop just as we do today. 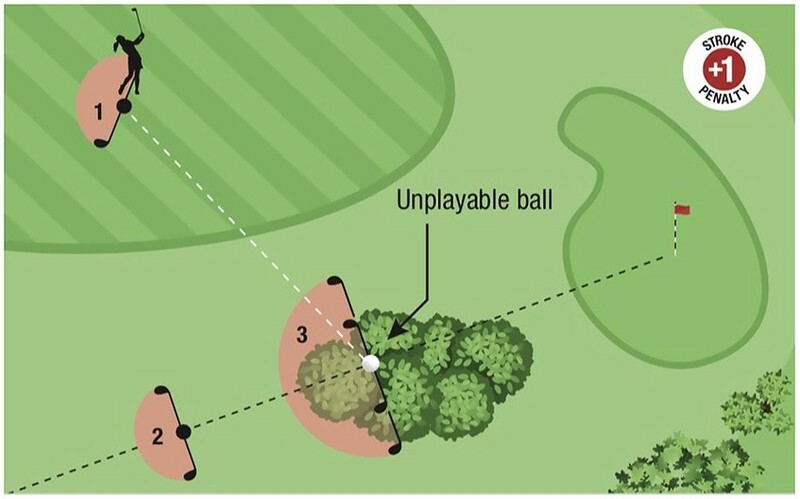 If the placed ball will not stay at rest on that spot, it must be placed on that spot a second time and if it still will not stay there, it must be placed on the nearest spot where it will stay at rest, no nearer the hole. The Relief Area is the area where a player must drop a ball when taking relief under a Rule. The Relief Area is a defined area that is equal to the length of the longest club carried by a player, other than a putter. No matter what club is used to measure, the ball must come to rest within the longest club, other than a putter. Using a putter or sand wedge will not provide a smaller relief area. The one club-length Relief Area will be uniform for all procedures, except when a player is using the two club-length “Lateral Relief” option from a red penalty area or from an unplayable ball. No matter if a player is dropping a ball from an immovable obstruction, from an embedded ball, from a wrong putting green, when using “Back-On-The-Line Relief” under penalty, or when using the “Stroke-and-Distance Relief” option under penalty, the Relief Area is one club-length. When taking free relief or penalty relief, the original ball or another ball must be dropped in the relief area. You cannot touch the sand in a bunker when making a practice swing or in the backswing for the stroke. 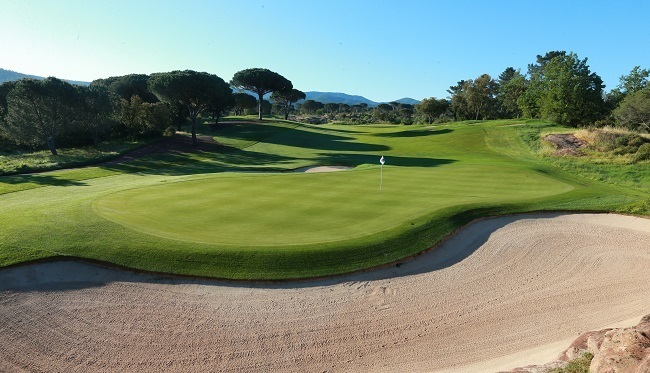 You cannot deliberately touch the sand in the bunker with your hand, club, rake or other objects to test the condition of the sand to learn information for the stroke. You cannot touch the sand in a bunker with a club in the area right in front of or right behind the ball, except when searching or removing a loose impediment or movable obstruction. Penalty Area is the new name for Water Hazard. Penalty Areas will still be marked either Yellow or Red. In a Penalty Area the player can now ground the club lightly behind the ball, move a loose impediment, take a practice swing and touch the ground or the water. Damage to a putting green may be repaired. Damage is described in the Rule and it means any damage caused by a person or outside influence and includes ball marks, old hole plugs, turf plugs, shoe damage (such as spike marks) and scrapes or indentations caused by equipment or the flagstick. Any repair must be done promptly. It does NOT include natural surface imperfection, disease, aeration hole or natural wear of the hole. The line of play on the putting green may now be touched, including when pointing out a line for putting, but the line must not be improved beyond what is now permitted when repairing damage, i.e. : the player may NOT create a pathway or channel to the hole. If the player’s ball on the putting green moves after the player had already lifted and replaced the ball, the ball MUST be replaced on its original spot, which if not known must be estimated. This is the case no matter what caused the replaced ball to move, including natural forces (wind). The time to search for a ball is reduced from 5 minutes to 3 minutes. The time of search still starts when the player or caddie begin to search. If the original ball is found, the provisional ball must be abandoned. 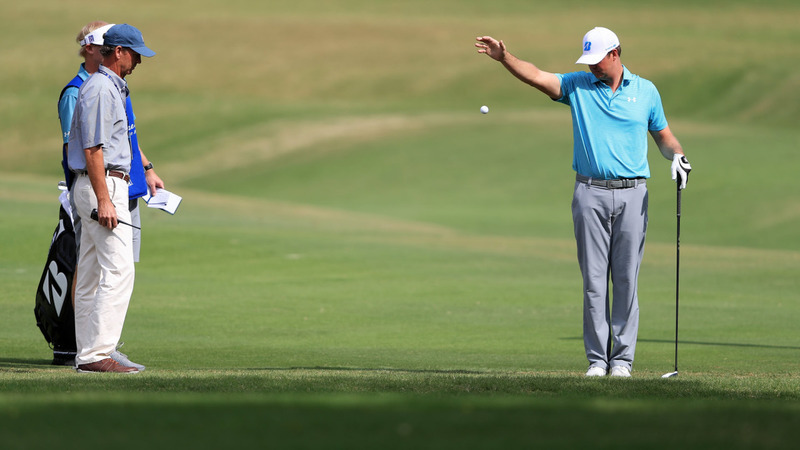 Once the search time has begun, there is NO penalty if the ball is accidentally moved during the search by anyone including the player or caddie. Simply replace the ball in its estimated position. The player can now go back to where the ball was last played and play a provisional ball at any time before the original ball is found. The player must still announce that the ball about to be played is a provisional ball. The player must use the word “provisional” or otherwise clearly indicate that he or she is playing the ball provisionally. The relief procedure has changed for an embedded ball. The relief area starts at the spot right behind where the ball is embedded. A ball must be dropped in the one club-length relief area, not nearer the hole than this spot, and in the General Area. When using the “Stroke-and-Distance Relief” option, the player must now estimate where the previous stroke was played and drop a ball within one club-length of that spot not nearer the hole. When using the “Back-on-the-Line Relief” option (No. 2 option) or keeping the place where the ball lies between you and the hole, the player can now drop in a one club-length relief area rather than exactly on the line itself as was done previously. Using the 2 club-length “Lateral Relief” option (No. 3 option) when a ball is unplayable, the ball must stay in the 2 club-length relief area when dropped. It can no longer roll 2 club-lengths from where it strikes the ground. A caddie will now be able to mark, lift and replace the player’s ball (if he lifted it) on the putting green ONLY, without needing authorization. The player is still responsible for any related breach of the Rules. A caddie will NO longer be able to align the player while he is taking his stance for any stroke. There are strict Rules about where the caddie may deliberately stand when the player begins to take his stance. Although in 2019 the Rules of Golf will allow the everyday use of Distance Measuring Devices (DMD’s) without measuring elevation changes; the PGA TOUR will be adopting a Local Rule on our Hard Card which will prevent the use of DMD’s during any tournament rounds. Penalty for first breach of this Local Rule during a tournament round is two strokes in stroke play; second breach during the same round Disqualification.